Sometimes great innovations come as a result of solving a problem that is really bothering us in our daily life. However, at other times ground-breaking innovation occurs when we stop believing that everyone is like us and begin to understand the lives of other people. Naturally, this is not just useful for those pursuing innovation, but is also essential for leaders who are unlikely to have a team of people just like them. The ability to enter into the thoughts, feelings and emotions of someone else is often referred to as empathy. As ever, a tool can be useful to prompt us and get us started in trying to do what is a surprisingly hard task. 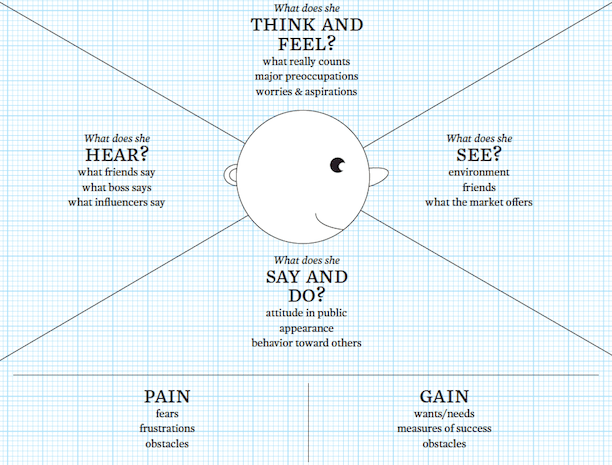 XPlane’s ‘Empathy Map’, as described in Business Model Generation is essentially a set of questions that hopefully start us on a journey of discovery, challenging us to consider how well we really know the people we serve.